Written in conjunction with The National Society for Education in Art and Design, the International Encyclopedia of Art and Design Education offers an indispensable resource for students, scholars, and researchers working in the field of art and design education. It contains accessible introductions to key topics, concepts, and thinkers, as well as sophisticated debates on contentious areas, covering the whole age range from early years to post-university in formal and informal settings. This multi-volume reference work examines historical and contemporary art and design education worldwide, from over thirty different countries, in Africa, Europe Asia, Australasia and the Americas. It includes topics such as Epistemic Disobedience in Contemporary Latin American Art; Visual Arts Education in Museums; Elementary Art and Design Curricula; Social and Mobile Media in Art and Design Curriculum; Performative Literacy; Postmodern Pedagogical Principles of Museum-Informed Art Education and much more. 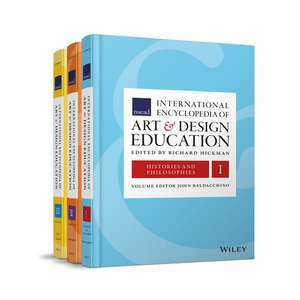 The International Encyclopedia of Art and Design Education defines the conversation for the entirety of the art and design community through authoritative reference of peerless quality.